Many countries are adopting and implementing policies towards zero emissions of vehicles using renewable energy sources to limit the effect of climate change in the world. In fact, their aspirations for nearly all new vehicles to be electric-drive or have near-zero emissions in the 2035-2050 periods. Electric vehicles, beyond consuming less energy, enable greater use of low-carbon and renewable energy sources than are available from conventional petroleum-based fuels. Electric vehicle promotion efforts across the world are increasingly diverse, with many governments, automakers, and advocates pushing to promote awareness and sales of advanced electric-drive vehicles, as well as the necessary regulatory, charging infrastructure, and financial support. To promote the electric vehicles, Proterra is answering the international call for efficient, cost-effective and environmentally responsible heavy-duty vehicle solutions. 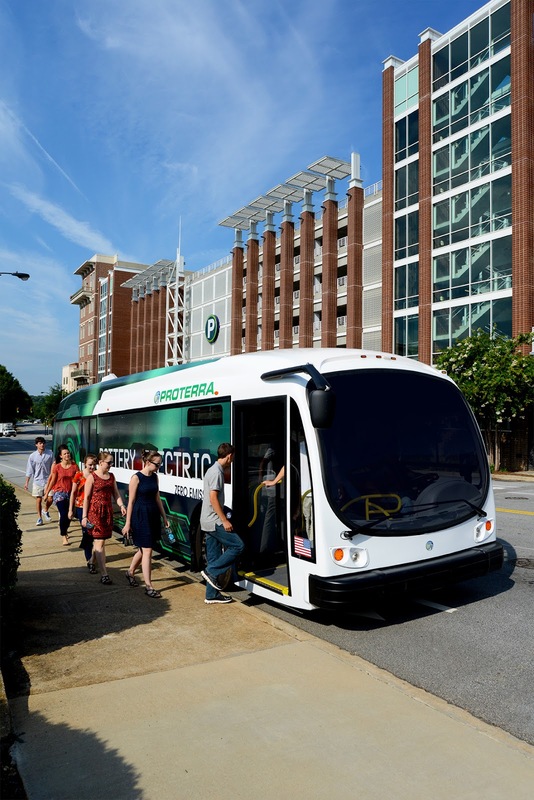 Headquartered in Greenville, SC, Proterra is a leading designer and manufacturer of heavy-duty drive and energy storage systems, vehicle control systems and complete transit buses. Proterra’s focus on designing state-of-the-art transportation has led to the development of a number of impressive electric vehicle models. Proterra’s systems are scalable to all forms of commercial buses and Class 6-8 trucks. 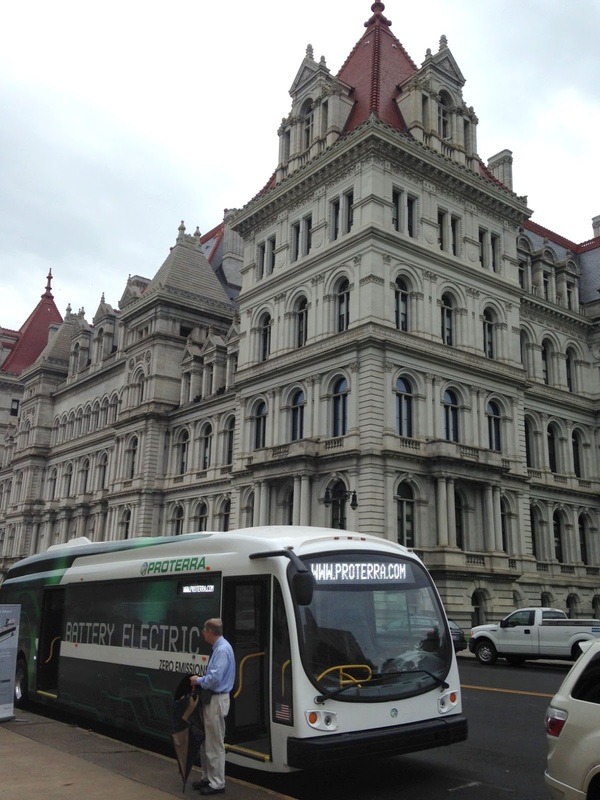 Proterra's initial product, a 35' battery-electric transit bus, has been designed from the ground up to enable a world's first ever solution for transit agencies to replace conventional diesel buses on a one-for-one basis with all-electric buses operating 24/7. This is accomplished by combining Proterra's light-weight composite body, highly efficient ProDrive, advanced TerraVolt energy storage system and on-route rooftop FastCharging station to charge the bus in 5-10 minutes. The vehicle achieves between 18 and 29 miles per gallon diesel fuel equivalent fully loaded with 68 passengers - 500% better than a comparable diesel bus. Proterra's high-voltage overhead charging system uses robotic control (and some autonomous software on the bus) to replenish bus batteries in as little as 10 minutes, depending on the size of the battery pack. Charging at 250-1000V (DC) and up to 1400A, the system is eight times faster than the CHAdeMO fast-charging standard and between three and four times faster than Tesla's Superchargers. The company has sold more than 252 vehicles to 28 different transit agencies throughout the U.S. 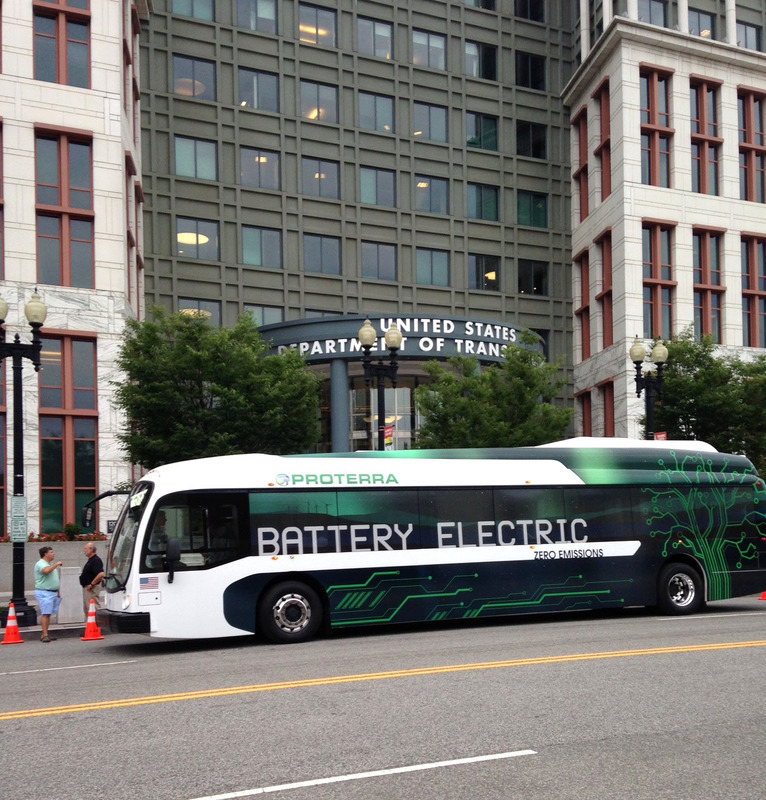 Recently, Proterra has released its patents on its fast-charging technology, a move aimed at accelerating the adoption of electric transportation. It would grant anyone royalty-free access to its patents covering its single-blade overhead charging design as well other related components. The Catalyst vehicles being the latest, which are available in two sizes – 35 and 40 feet has build upon the innovative heritage of the EcoRide. These vehicles are up to 500% more fuel-efficient than a typical diesel or CNG bus that tremendously reduces the operating cost, says company’s website. Proterra has also demonstrated that its electric bus can travel over 700 miles in a 24 hour period, alleviating customer concerns about limited range. The Proterra Catalyst Extended-Rande (XR) bus uses the enhanced TerraVolt XR battery packs that stores between 53 kWh and 321 kWh on a single charge. The Southeastern Pennsylvania Transportation Authority (SEPTA), Proterra and PECO will demonstrate their shared commitment to sustainable transit by providing test rides on an American-made electric bus, the Proterra Catalyst. SEPTA, along with Proterra and PECO, invites residents, delegates and visitors to SEPTA headquarters at 1234 Market Street to tour and ride SEPTA's soon-to-be-deployed battery-electric bus on Monday, July 25 from 1-5 p.m., and Thursday, July 28 from 9 a.m.-5 p.m, says Proterra’s press release.